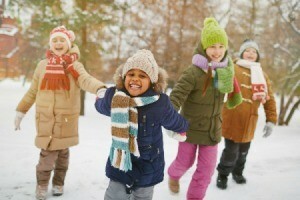 Children love playing in the snow, but need to be dressed well to protect them from both the cold and moisture. 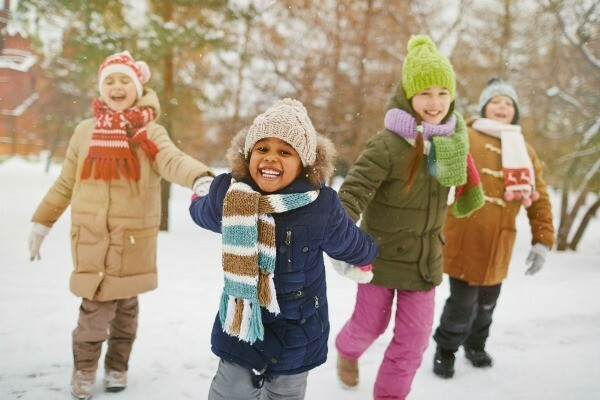 This is a guide about keeping kids warm while playing in the snow. When your children are ready to go out and play in the snow a great way to keep them warm is to have them wear their pajamas. The ones with the feet in them and the long zipper up the front. My 10 year old daughter came up with this idea and it has worked great for keeping her feet warm and dry. Editor's Note: I assume Perri means to wear them under winter clothing. Great ideas! I just wanted to add to make sure kids aren't OVER dressed to play in the snow! As an outdoor lover since I was a kid, I've found that if I get too bundled up because it's cold out, I'll overheat and get sweaty once I get moving. Layering is the best way I've found for going out. The footie PJs would be a great base layer worn underneath sweats like the PP said, and then a lighter jacket like a fleece and then a lined nylon jacket to protect from wind and water. Snow pants and warm socks and plastic bags round out a great wintertime play outfit. I've also found that getting ready to go outside and then sitting down inside for 5-10 minutes helps your outer layers build up heat from your body and the warm air inside which in turn helps keep you warmer longer! The plastic bags in your boots is a great suggestion! It works wonderfully, I still use baggies on my feet all winter and in the woods after it's rained to keep feet dry. My husband wears baggies hunting too and it works like a charm! A lady I know used to live in snow country. She said to keep snow from getting down the sleeves of her children, when out playing, etc. She'd cut the elastic tops off of crew socks and sew on to the cuffs of their mittens and/or gloves. They'd put on their gloves/mittens last and put the long cuff over their coat sleeves. No more snow in their coat sleeves and next to their skin.